This December marks the 60th anniversary of the Montgomery Bus Boycott victory that ignited the Civil Rights movement and led to the dismantling of the “Jim Crow” system of segregation. Montgomery’s black population mounted a massive determined struggle involving 50,000 people, overcoming a violent backlash and virulent opposition from the political establishment. Today, Black Lives Matter has opened a new era in the movement for black freedom. With Shaun King’s recent call for mass national boycotts to begin on this year’s anniversary of the Montgomery boycott, the lessons from that historic movement have never been more relevant. The U.S. Civil War, one of the most progressive events in modern history, brought an end to the institution of slavery that had been preserved in the young nation’s constitution. Reconstruction opened up the possibility of a social order without white supremacy, but this was tragically betrayed by the Northern ruling class in the face of ferocious resistance by the Southern white elite. Racism was codified explicitly into the law, and two separate and unequal ways of life were maintained, one for whites and one for blacks. Southern facilities were racially divided: from restaurants to water fountains to taxi cabs. Slavery was gone, but the racist system of “Jim Crow” took its place, backed up by intimidation, violence, and murder. Lynchings were used to brutally and publicly terrorize the black population, and rallies were sometimes held beforehand, often with Democratic Party speakers. The Democratic Party historically had been the party of the slave-owners. In the decades before the Montgomery boycott, the northern Democratic Party began making superficial appeals to black voters, but the Southern “Dixiecrats” continued to represent white large business owners who had a direct material interest in maintaining the racial hierarchy. There were heroic efforts to organize workers in the South but the Southern elite largely succeeded in keeping unions out, which resulted in much worse wages and working conditions for both white and black workers compared to the North. A key source of the strength of industrial unions like the United Auto Workers (UAW), part of the radical Congress of Industrial Organizations (CIO), was based on uniting black and white workers in action against the bosses. Socialists played a key role in building the CIO unions and understood the necessity of uniting workers regardless of race, ethnicity or gender. Labor leaders knew that organizing the South was vital to the further development of a united and powerful national labor movement. However, the refusal of the CIO union leaders to challenge Jim Crow and McCarthyism during its “Operation Dixie” organizing drive in the 1940s tragically left the Southern working class deeply divided – a key setback for the whole labor movement. Things began to change during World War II when over 500,000 blacks fought – in racially segregated units – and many died or were injured fighting the Nazis to defend “democracy and liberty.” After enormous sacrifices for the U.S., many returned home determined to no longer accept oppression. In the post-war period, the country experienced its biggest economic upswing in history. The invention of the television brought commercials for automobiles, washing machines, and refrigerators directly into people’s living rooms. Many whites were paid enough to enjoy the new way of life created by these products, but blacks were largely left behind. At the same time, African Americans were inspired by the revolutions taking place throughout Asia and Africa which were evicting European colonial occupiers and establishing independent governments led by people of color. Against this background, the U.S. Supreme Court felt compelled to issue its Brown v. Board ruling in 1954, striking down laws mandating separate schools for white and black students. But with blacks’ expectations on the rise, this victory only spurred on demands for more far-reaching changes. Higher expectations and increased confidence contributed to Rosa Parks’ refusal to relinquish her place on the bus to a white person in Montgomery on December 1, 1955. She boldly defied the local law requiring blacks to give up their seats so whites could sit, and she was arrested. We are often told that Rosa Parks was a tired seamstress who just wanted to rest after a long day’s work – an individual who merely acted on her own. But Rosa Parks was in reality an experienced activist. For 13 years she had been the Secretary of the local chapter of the National Association for the Advancement of Colored People (NAACP). Only five months before she had attended a two-week training on non-violent civil disobedience at the Highlander Folk School founded by Communist Party activists. The WPC immediately mobilized their members to print and distribute 35,000 fliers calling for a one-day bus boycott. E.D. Nixon, a local NAACP officer and a union local president, convinced black ministers, including a new reverend in town, Martin Luther King, to promote the boycott in their Sunday sermons. No one knew whether blacks would really boycott the buses the next day, and many were stunned to discover them essentially empty! Organizers initially planned for the boycott to last only one day, but the struggle developed a dynamic of its own. The night after the boycott, a staggering 15,000 African Americans attended a mass meeting, and Martin Luther King inspired them to commit to extending the boycott until their demands were met. Participants rapidly formed committees and began organizing various aspects of the campaign. Before the boycott began, approximately 17,500 blacks had been riding the bus every day. (3) Most were low paid workers who could not afford their own cars or taxis, so the community had to develop creative alternatives. They rode bikes, carpooled, or even walked for multiple hours, rain or shine. Activists developed a sophisticated carpool system involving thousands of volunteers and overcame enormous logistical and financial challenges. The movement faced a ferocious backlash. A White Citizens Council was formed to encourage whites to ride the buses and oppose the boycott, and its membership grew rapidly. White police officers ticketed hundreds of carpool drivers for minor traffic infractions, and arrested blacks on trumped up charges, including King himself, for driving five miles over the speed limit. However, violence failed to intimidate the movement. So in February, city officials started enforcing a seldom-used Alabama statute against interfering with private business. They arrested 89 blacks for participating in the boycott. (6) King was sentenced to spend 368 days in the penitentiary or pay a hefty fine. (7) Insurance agents also denied coverage to black car owners known to be participating in carpools. After half a year of mass struggle, a federal district court ruled that Alabama’s bus segregation law was unconstitutional. However, the ruling was appealed. But each legislative maneuver and racist attack only served to strengthen the resolve of African Americans who were overcoming their fears and becoming conscious of their collective power. The boycott was cutting into the sales of white-owned businesses. As the second Christmas shopping season of the boycott approached, they initiated talks with boycott leaders in hopes of negotiating a compromise. Early on, the black community might have accepted a partial settlement, but at this point they had sacrificed too much and come too far. Finally, after a year-long grueling battle, in November 1956 the Supreme Court upheld the lower court’s decision that banned segregation on Alabama’s buses. It would take another month still before federal authorities forced local authorities to heed the decision. 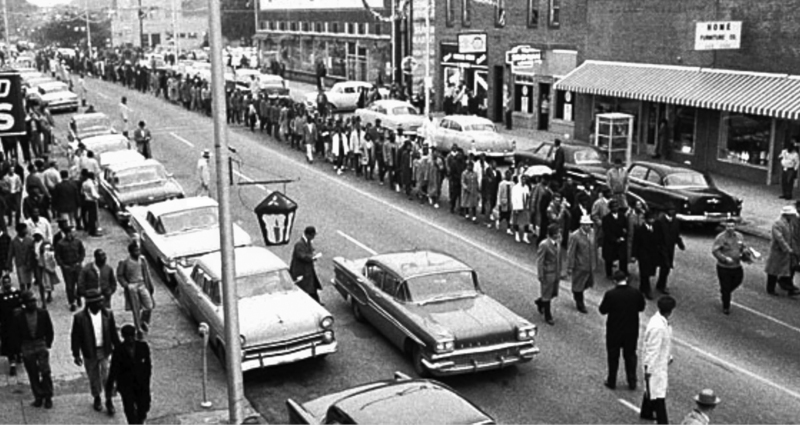 On December 20, black leaders called a mass meeting to declare victory, and the boycott was ended. African Americans began boarding buses again, sitting proudly wherever they pleased. Violence and harassment still continued, but the community’s victory gave blacks throughout the U.S. an enormous boost of confidence. The incredibly inspiring victory in Montgomery paved the way for the largest revolt of African Americans in U.S. history which would put an end to Jim Crow. The boycott was truly a mass movement, with tens of thousands of working-class blacks attending regular mass meetings, sometimes nightly, throughout the year-long campaign. These meetings were the backbone of the movement; they enabled people to coordinate, exchange experiences, and muster the courage to keep fighting. King emerged at these meetings as a leading figure. His speeches outlined the campaign’s accomplishments and challenges, provided a vision for taking the movement forward, and placed their fight in the context of the broader struggle for equality and freedom. The campaign was won by the combination of the courageous sacrifices of tens of thousands of African Americans, King’s inspiring leadership, and the role of activist organizations in building the mass direct action. King’s poetic words gave voice to the struggles of black people: “We have known humiliation, we have known abusive language, we have been plunged into the abyss of oppression, and we decided to raise up only with the weapon of protest.”(12) His strategy of mass, non-violent struggle contrasted with that of the more moderate NAACP leaders who had focused on a legal strategy confined to courtrooms, fearing that mass direct action would alienate Democratic and Republican politicians. The Civil Rights movement made real gains when it stopped waiting for approval from liberal politicians and acted collectively to defy unjust laws, a key lesson for us today. The growing support for Black Lives Matter shows the renewed potential to build a powerful mass movement against institutionalized racism and inequality. Shaun King’s call for a mass boycott starting December 5th could help broaden that struggle. The Montgomery Bus Boycott shows we will win real change not as lone individuals or small groups, but by building organizations of oppressed and working-class people, and mass movements too powerful for the establishment to ignore. It is worth noting that the Montgomery boycott strategically took aim first at one form of segregation, not the whole system of Jim Crow. But when activists organized a targeted boycott of the private bus companies and won, their victory had implications far beyond one city’s buses. It became an historic turning point in the struggle against segregation. A similar targeted and successful boycott today could again help develop the confidence of oppressed people to fight for fundamental change. Legalized segregation based on overt white supremacist ideology was defeated by the Civil Rights movement, but institutionalized racism continues. Schools are as segregated as they were in 1954 and the Great Recession of 2008-9 led to the biggest loss of wealth in the black population since the Civil War. Ending entrenched structural racism will require the same kind of determined mass struggle we saw in Montgomery. While fighting for every reform possible within the framework of the current social order, we must also recognize that the only way to end institutionalized racism and discrimination is to end capitalism. Key to ending racism and capitalism will be the organized social power of the black working class, as part of a united, multi-racial and militant labor movement, like the CIO of the 1930s and ’40s. In fact the struggle for black freedom in the past and today has acted to push forward the class struggle generally. The Civil Rights struggle opened up a period of wider radicalization in the 1960s and ’70s which could have led to challenging capitalism as a whole. BLM today is the sharp end of a wider radicalization especially among young people which is opening up a new era of struggle in American society. (2) Voices of Freedom: An Oral History of the Civil Rights Movement, Hampton & Fayer. (3) Chris Kromm, “After Rosa Sat: The Genius and Success of the 13-month Montgomery Bus Boycott,” CommonDreams.org, 12/5/15. (4) Eyes on the Prize, America’s Civil Rights Years 1954–1965, documentary episode 1, 1987. (9) Eyes on the Prize. (11) Paul Schmitz, “How Change Happens: The Real Story of Mrs. Rosa Parks & The Montgomery Bus Boycott,” HuffingtonPost.com, 1/28/15. (12) Howard Zinn, A People’s History of the United States, (New York: Harper & Row, 1980), p. 443. The Poor People’s Campaign at 50 – The Radical Legacy of Dr. Martin Luther King, Jr.